Cross-Polarized Wave (XPW) generation is a nonlinear third order process during which fundamental and generated waves have the same frequency; however, generated wave is perpendicularly polarized to pump wave polarization. Phase matching occurs over large bandwidth in XPW generation process. This means the same phase and group velocities for fundamental wave and XPW. Cross-polarized wave (XPW) generation process is driven by the third order nonlinearity of the crystal, and the anisotropy of the sensor. The typical optical material used for cross-polarized wave (XPW) generation is Barium Fluoride (BaF2) crystal with z () or holographic () crystallographic orientation. Theory predicts a maximum XPW energy conversion efficiency around 35% when using -cut BaF2 crystal with a concomitant pulse shortening factor of √3 corresponding to a pure third-order nonlinear process. 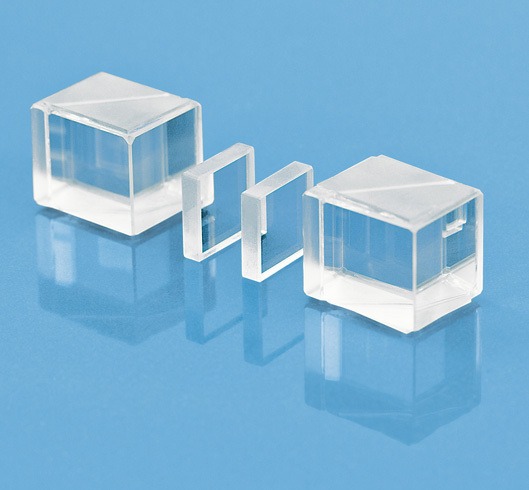 EKSMA OPTICS offers  orientation BaF2 optical crystals (XPW crystals) for Cross-Polarized Wave (XPW) generation. BaF2 optical crystals with orientation  as well CaF2 optical crystals are available on request.